United Cigar’s La Gianna brand sports Honduran binder and filler tobaccos. There are two different wrapper varieties: Maduro and Natural. The latter has a pale Connecticut Shade wrapper that’s dry and smooth. Once lit, the Robusto’s (5 x 50) faint pre-light notes of hay and molasses transition to a mild, somewhat papery profile of dry oak, butter, and almond. 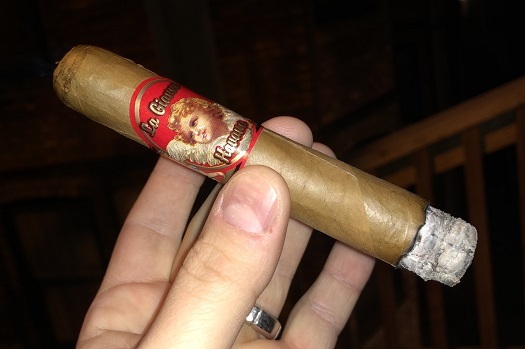 As it progresses, the cigar picks up a little body and adds flavors of cedar spice, toast, and cream. Construction is outstanding. While the Robusto isn’t a bad buy at around $6, it’s a bit too mild, flat, and dry for my liking, which is why I cannot give it a full recommendation. But feel free to give it a try if you’re looking for an inexpensive mild smoke to pair with morning coffee.